Okay, so we have more X-Men Origins: Wolverine news. Yesterday, it was just but Variety.com has confirmed it that indeed, Ryan Reynolds will be playing Deadpool in the movie. And being a Wolverine fan that I am, I am keeping close track of the movies progress. Much like with 300, this Wolverine movie has got to be one of my most anticipated movies as a comic-turned-movie fan. 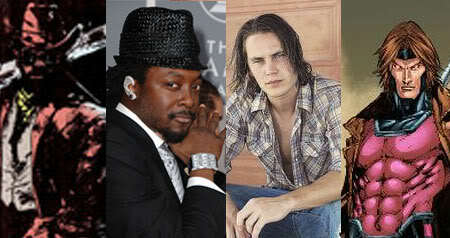 It was also announced that Friday Night Lights star Taylor Kitsch and Black-Eyed Pea will.i.am will be in the movie, we only got word today on who they would be playing. Taylor Kitsch will be playing the card-dealing Cajun, Gambit. Now, I’m not too sure with how Gambit fits into the whole Wolverine story (this was probably the time that I wasn’t too focused on comics anymore) but hey, might just be an excuse to introduce the character. As for will.i.am, he’s slated to play the role of Kestrel/John Wraith, the powerful teleporter that’s part of Team X.
Ryan Reynolds to play Deadpool in X-Men Origins: Wolverine?